I reached for my thesaurus to figure out the right word to replace that not-quite-right “undisobeyable,” and was dismayed to find no such word for exactly what I meant. What I am trying to express is a sense that the boy felt that disobeying was simply not a physically, emotionally, humanly possible option. He was not capable of refusing the king’s order, no matter how much he wanted to. You’d think that the double negative “undis-“could be simplified to give us the positive obeyable. But obeyable, besides being clunky, means you can obey, but not that you must obey. Obeying is wholly optional. The words that should mean you have to obey include mandatory, obligatory, and compulsory. But these really just mean that the law says you must obey, but not that you are actually unable to break the law. Plus, they would apply more to the action than the order, as in the killing being mandatory, rather than the king’s voice being mandatory. 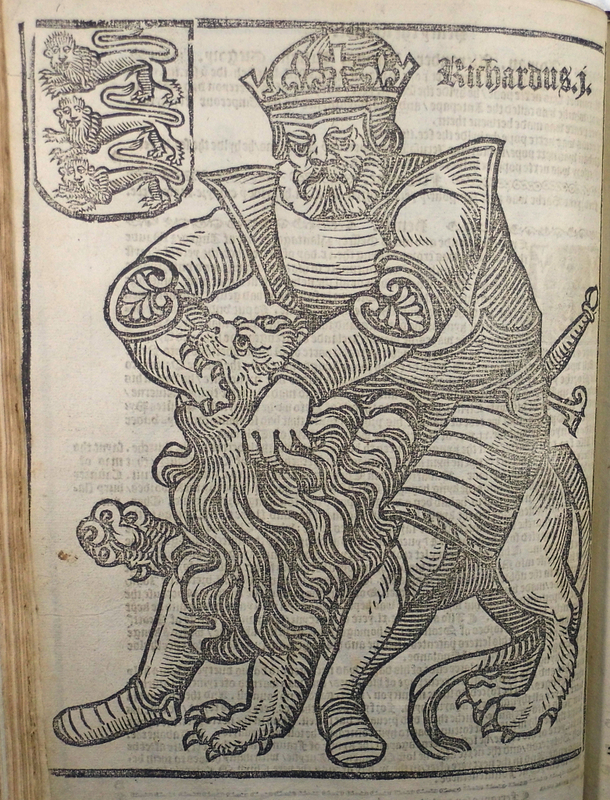 The king’s voice might be commanding, authoritative, imperative, imperious, peremptory. But these tell more about the attitude of the speaker than the effect that his voice has on the hearer. We already know the king of the Faeries is issuing a command, and these adjectives don’t really explain the additional power of his voice that I’m trying to express. Irresistible and compelling have the right sense of being unable to be resisted, but they make it sound like the boy is convinced rather than forced, and irresistible is much too positive, anyway. Overpowering and inescapable, when describing a voice, just sound loud or penetrating. Relentless and inexorable are close, but I already used them both in the preceding lines! Of course I could just leave undisobeyable - other authors have used it. But it sounds awfully clunky, and if my readers get thrown out of the flow to wonder whether that’s even a real word, that defeats my purpose altogether. I think what I’ll have to do is rewrite the sentence completely, or simply leave it out. But I feel quite aggrieved that in a language with insane numbers of synonyms, we don’t seem to have a word for just this particular usage. English doesn’t fail me often, but it’s interesting (if frustrating!) to examine those cases when it does. Of course, if anyone does think of the perfect word I’m missing, please let me know! 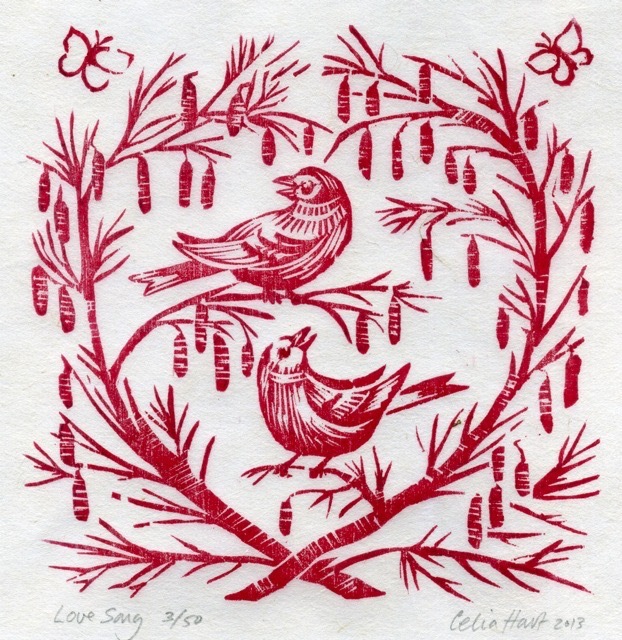 Here’s another block printed alphabet, and this time of a very different style. James Brown’s alphabet doesn’t depict animals or people or anything starting with each letter, as my other featured alphabet books and collections have done. Rather it’s simply a graphic representation of each letter itself. Each of Brown’s letters is a linoleum block print in two colors, and the interesting thing is that they are actually the same block printed twice in different colors and at different orientations. The way the letters are designed almost to tesselate, as the F, or to set up interesting secondary patterns, as the A, is clever and fun. In some, such as the K, the letter would probably be clearer (if less graphically interesting) if it were printed only once, but in others, such as the Z, the double printing helps make the letter pop. Still others, including the U, require both orientations of printing to be combined in order to form the letter completely. In many cases I’m not crazy about the color combinations, but in some, such as the H, the layering of the two inks adds an interestingly different third color to the image. Another interesting feature of Brown’s printing is its imperfection. 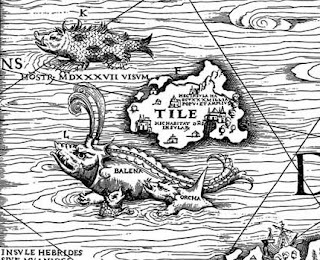 There are areas of lighter ink, lines where the edge of the brayer isn’t smoothly blended, and even little bits and blotches where scraps of linoleum or dust got caught in the ink. 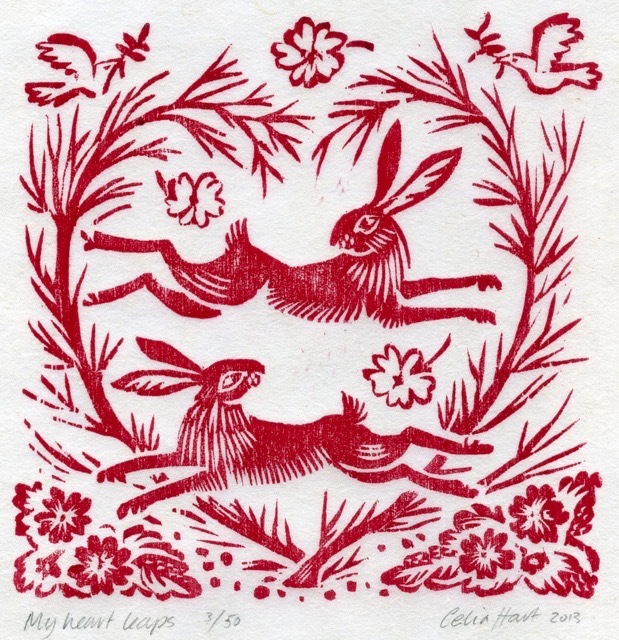 Normally these would be considered to have ruined the print, but Brown obviously embraces them as part of the graphic quality of hand-printed pieces. Naturally I don’t love these as much as my favorite black and white animal alphabets, but I do think they’re very cleverly designed. I also think they must have been fun to play around with! 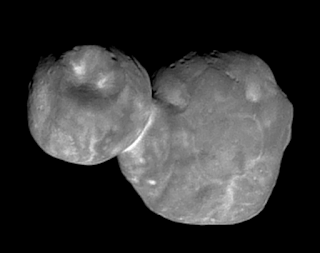 And of course they certainly make for some interesting variety, and variety, as we all know, is the spice of life. I spent this weekend at Boskone 56, the convention of the New England Science Fiction Association. I had a great time and thought I’d share a few of the highlights. On Sunday I gave a workshop on using poetry as a tool in world-building, and spent some time making treasure maps with the kids’ program, and of course throughout the weekend I attended other panels and workshops, mostly on writing, and I enjoyed the entire art show. I closed out the art show with excellent sales, including the last “Capybureau”! It was a very small edition (only 6), but even so it’s set a record for selling out, and this from a critter I had thought no one would actually want to buy. And to cap it all off (Ta DUM!) 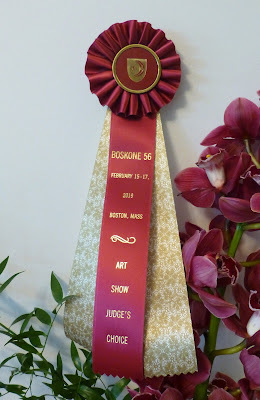 I received a Judge’s Choice ribbon for my “body of work” on display. 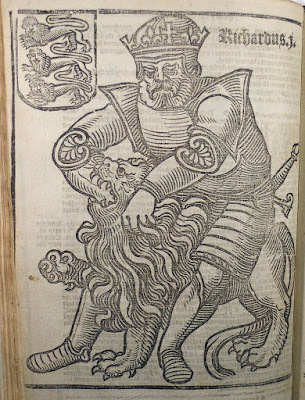 I am thoroughly honored and feeling very encouraged as I plug away pretty steadily at my mythical bestiary. It may even be ready to bring to Boskone 57, which would be very exciting. So I send out great big thanks to everyone! 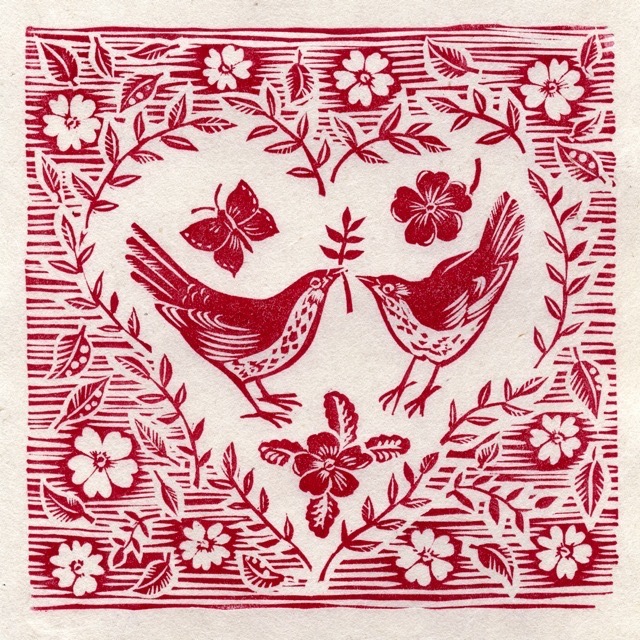 Here are some sweet block prints for Valentine’s Day by British artist Celia Hart. 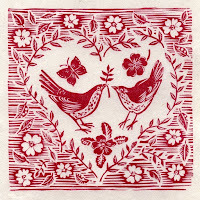 This first piece, featuring not only heart and flowers, but a love offerring, is the perfect Valentine. I like the detail on the primrose at the bottom center, and the use of the striped background to accent the heart. You can’t go wrong with this image of Valentine’s sentiment. 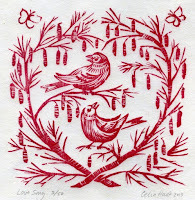 Hart is inspired by the Suffolk countryside where she lives and includes lots of natural details in her work. 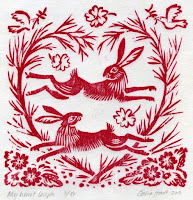 the two hares regarding one another with delight, and it’s impossible not to catch the romance. 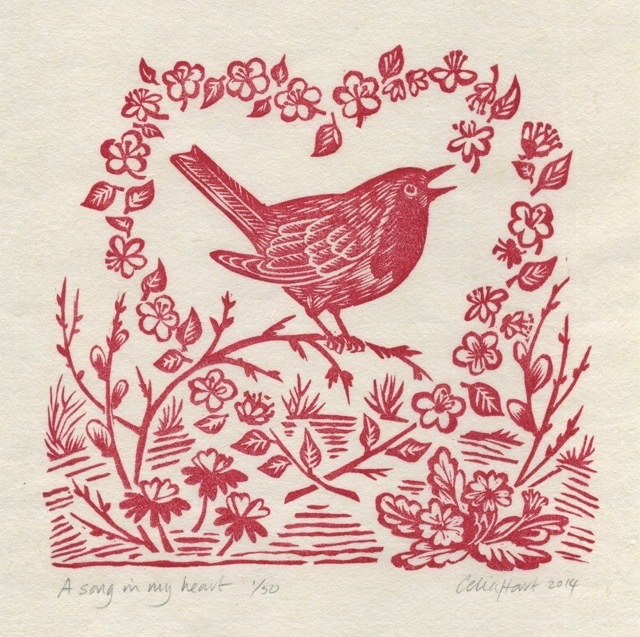 A final piece, just to round out the collection, entitled “A Song in My Heart.” There’s only the one robin here, but he’s singing a heart of flowers right out of the air. This one is carved a little more smoothly, with a little more detail, and I like the composition with a blending of natural background - earth, twigs, grasses - and graphic layout - heart just floating on the page. So, if you, like the first few images here, have a beloved partner this Valentine’s Day, be sure to let them know how happy you are to be with them. And if you don’t, then be like the robin in the final piece and keep spreading love all around you from the song in your heart. 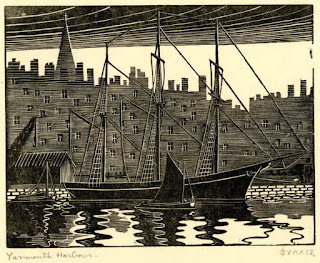 Phyllis Gardner (England, 1890-1939) specialized in wood carving at the Slade School, and obviously included wood block printing in that category, as well as sculpture. She later became a breeder of Irish wolfhounds and clearly loved dogs. 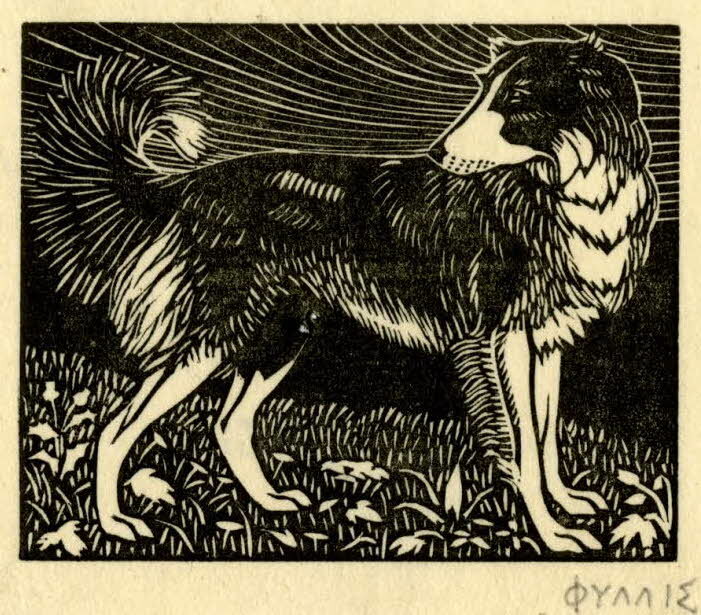 I love this woodcut of a dog, and although the British Museum describes it as a St Bernard, Gardner doesn’t seem to have titled the piece, and it looks more like a border collie to me. 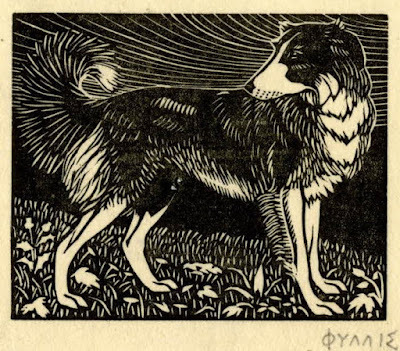 Still, I’m no dog expert, so I’ll stick to block printing: I like the boldness of the design, without sacrificing sensitivity, and I like the three swaths of background area, sweeping sky, solid black, and beautifully patterned lawn. Gardner signs all her pieces with her first name only, in Greek. This second piece is interesting because it has so little white. The entire image is composed of thin and even thinner white lines on black. 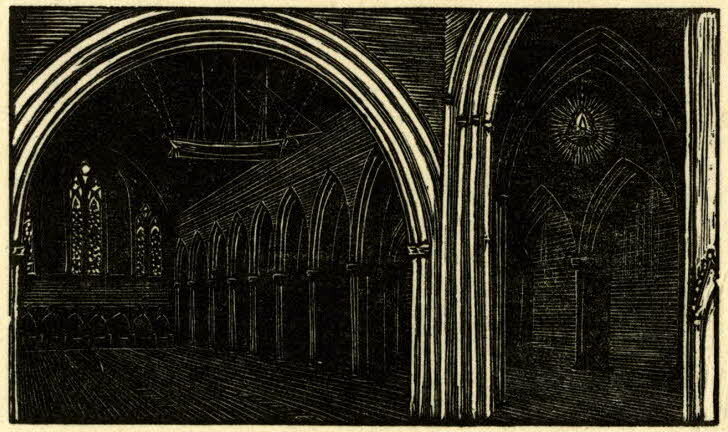 Nevertheless, it shows the arches in the shadowy interior, the suspended model ship common in coastal churches, and the sprinkle of light through the leaded windows. 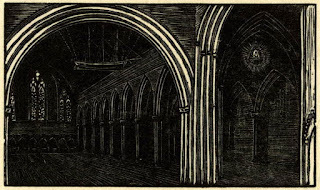 The composition is interesting because you’d think the focal point would be the votive ship or maybe the window, and instead the most striking part of the piece is the framing arches. 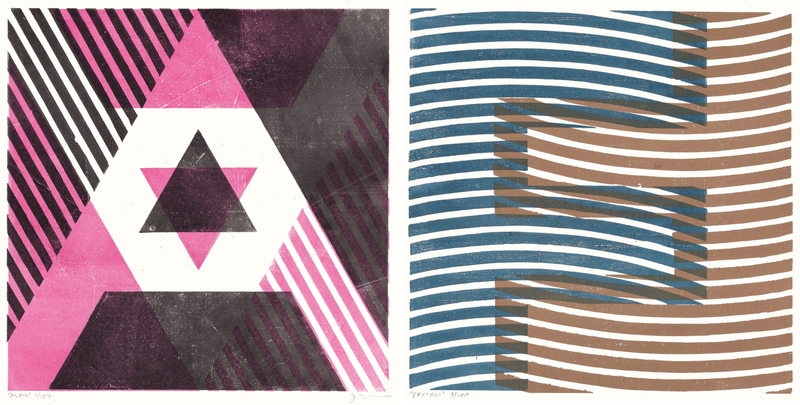 Gardner has used thin lines again, but for a very different effect in this third piece. The lines right across all the background buildings of the town give the impression of one huge building rather than a jumble of smaller ones, but it also allows the ships’ rigging to show up interestingly. She does manage the width of the lines so as to make the steeple show up behind the chimneys on the left, though. 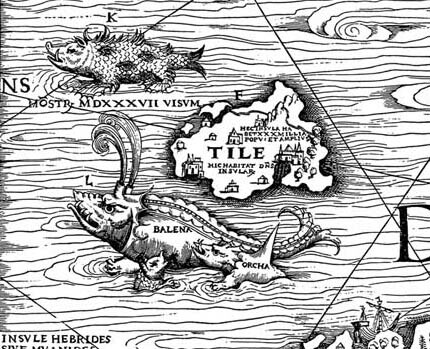 The water, by contrast, is curvy instead of straight, with larger areas of black and white instead of even “grey” texture. I like the punch of the different texture of the stone wall, as well. I enjoy Gardner’s use of line and darkness. 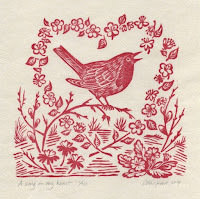 She’s taking advantage of what makes block printing different and special.